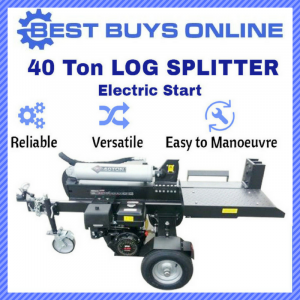 With powerful 50-ton splitting capacity and heavy duty LIFTING TABLE, this 50 TON LOG SPLITTER have become one of the most demanded log splitters on the market. 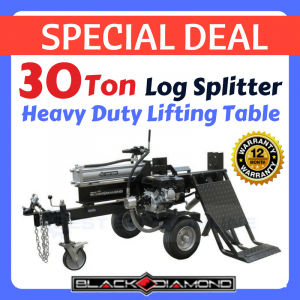 Having the famous Black Diamond brand that has been around for over 20 years, with thousands of products being sold all over Australia, this 50 TON Wood Splitter will enable you to handle various types and sizes of logs with much less effort. It comes up with the Heavy Duty Lifting Table for easy loading and unloading logs. No more back pain and save huge amount of extra times from bending over and picking up firewood to split again. The Lifting Table also allows storage for multile timbers . Another important feature is the AUTO RETURN CONTROL VALVE that automatically retracts when you remove your hand from the lever so that you can load the next log with minimal effort and time. The Auto Return Valve comes with safety relief function. The impressive 8" (200mm) hardened steel splitting wedge and an oversized commercial grade easily slice through the toughest of timber (while most of the other log splitters features 150-180mm height wedge only). One of the greatest benefits of this product is its powerful 15HP manual start engine petrol powered operation. 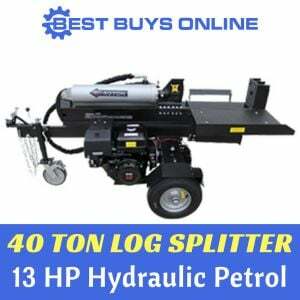 Last but not least, this SUPER-DUPER PERFORMANCE 50 TON has been one of the best selling log splitters on the Australian market for years thanks to its durability and safety functions. The log splitter has been made with Heavy Duty Construction for maximum strength and durability. Why not stop the backache out of chopping firewoods and let Black Diamond Log Splitter 50 ton help you? 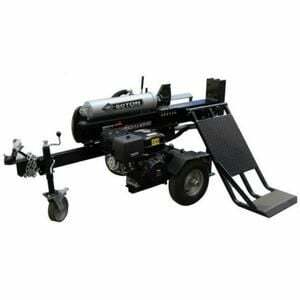 We have large range of Hydraulic Log Splitters, powered by manual or electric start engine. Product Assembly: The LS50LT will be delivered partially assembled in a crate. Please ensure that a suitable lifting unit is available such as a forklift or a crane are available to unload upon delivery otherwise a truck with a hydraulic tailgate will need to be organized at an additional cost. The unit can be assembled for an additional charge for local customers. - WITHIN capital city: You get FREE SHIPPING. - OUTSIDE a capital city: We can send the item to your door. We will charge you the difference in freight cost to the capital city and your delivery address. Let’s say the calculated freight to your nearest capital city is $150 and the shipping cost to your required destination is $250. Your freight cost is $100.